Yes, the zombie theme continues. For new readers, here’s a quick recap. I hate zombies, used to watch zombie movies B.C., came to Christ, and now don’t like them at all. I had a zombie nightmare in which God spoke to me very clearly, which you can read about in the post titled: I Hate Zombies. Then a publisher sent me a book in the mail called The Zombie Church; you can read my review in the post titled: Zombie Church. 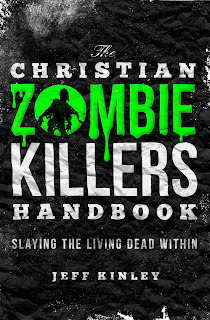 And now another publisher has sent me a book for review called The Christian Zombie Killers Handbook by Jeff Kinley. 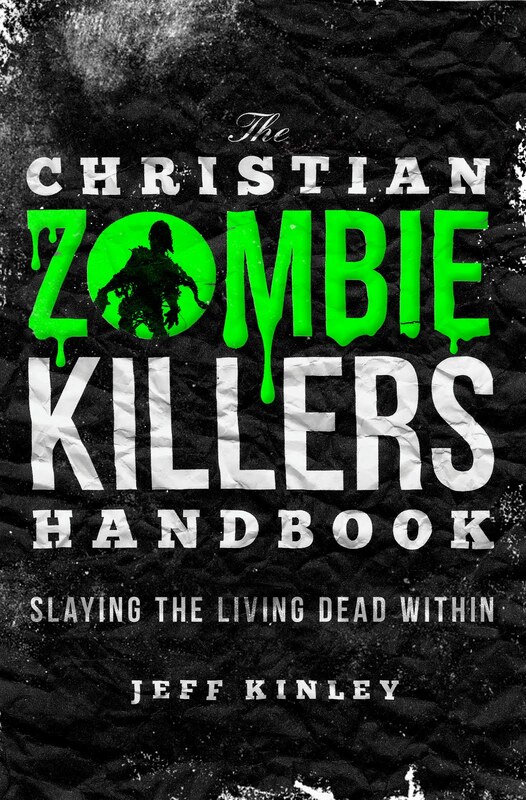 Kinley’s basic premise is that lurking deep within all of us is a flesh-eating zombie that thinks it’s alive, but it is dead in its sins, and the only way to oust the zombie and become truly alive is through Jesus Christ. Every other chapter reads like a systematic theology treatise, if that treatise was playing at the local grindhouse with back-to-back zombie apocalypses on the big screen. That said, the other chapters in the book that aren’t dealing with theology are not as good, nor are the graphic images of the undead. These chapters and images revolve around a science fiction story about . . . zombies (what did you think I was going to say puppies?). Here’s a taste of one of the sci-fi bits: “The raging redhead resumed feasting on Kyle’s arm, but was distracted by the scent of more flesh outside . . .” (p. 177). I really hate zombies. I know God is teaching me a lesson about being dead in our transgressions and sharing life with undead sinners that don’t know Christ using the zombie metaphor, but seriously, I don’t need these kinds of images running through my head. Once I figured out the rhythm of the book, I started skipping these narrative bits and just reading the theological premises. It made for a much better read. And if it weren’t for the “story” part, I would probably recommend the book, but since half of it is equivalent to watching a horror movie complete with gore and guts, I can’t. If you’re into that sort of thing, you can buy the book for $10.87.